No, its not a Treasure Hunt! Okay, so since we have cleared that up, let me explain why I led with that. See that black, circular “flame logo” on the side of the van? This logo has long been circulating in the Hot Wheels Graphics Department. It has appeared on many Hot Wheels and pre-2013 meant absolutely nothing. Since Hot Wheels adopted this logo to be that of the regular Treasure Hunts in 2013, newer collectors have been “fooled” into thinking everything with this logo is limited. While regular Treasure Hunts aren’t even that limited anymore, these pre-2013 Hot Wheels flame-logo’ed vehicles were plentiful and by no means “limited”. 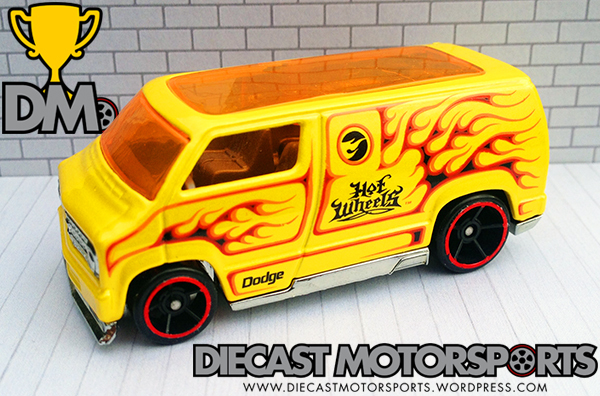 The van shown below is the Hot Wheels Custom ’77 Dodge Van casting and this was the initial release of the 2008 New Models van. This is the normal metal-bodied version of this casting. where the window on top of the van stretches the length of it. There are also two NOS bottles on the inside that are visible next to the back seats that have 4-point harnesses. The plastic-bodied version of this casting has a closed-off roof with grooves in it. There is also one additional release that had a custom roof rack when the van was transformed into a news van for the Anchorman release. 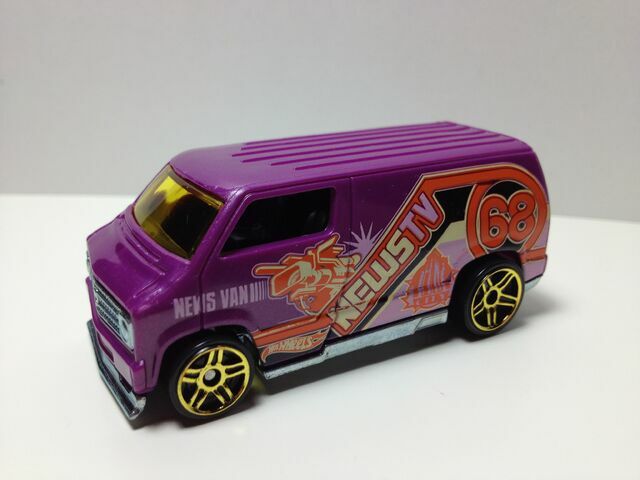 Designed by Hot Wheels Designer Jun Imai, this van is definitely race-inspired and its custom nature is incredibly popular with collectors. With over 29 versions since 2008, Hot Wheels seems to think the same. RELEASE DETAILS: Metalflake Yellow Body (metal). Orange-Tinted Windows. Gray Interior. Red-Rimmed, Black Open-Hole 5-Spoke (OH5) Wheels. Chrome Base (plastic). Made in Malaysia. Toy# L9922. Released in 2008 as part of the 2008 New Models Series.